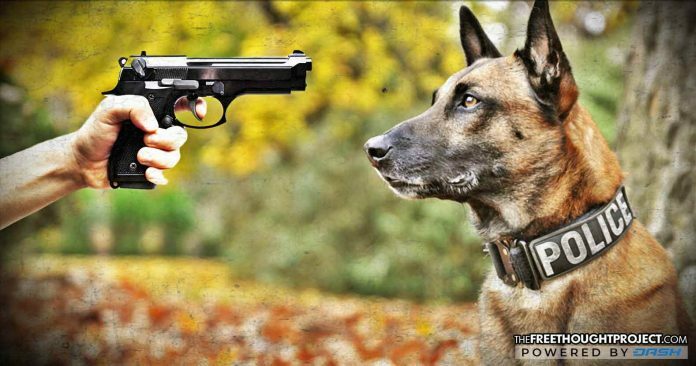 Chad Larner, the training director of the K-9 Training Academy in Macon County, Illinois said in a recent interview that police departments throughout the state may have to euthanize drug dogs if marijuana is legalized. Larner said that it would be abusive to retrain the dogs and that it could even be impossible. He also said that the dogs are trained to not be social because that is what the job requires. Other police in the state seemed to have similar feelings on the subject. Assistant Police Chief Steve Petrilli of the Normal Police Department said that it would be “impossible” to retrain the dogs. “At this point, they’re trained on five different odors. Once they’re programmed with that, you can’t just deprogram them. I think the implications of that would be huge,“ Petrilli said. However, it is actually possible to retrain the K9s, as many police departments in Washington have shown. Legalization activist Dan Linn of NORML thinks that the police are just making empty threats to scare the public. “The idea that legalizing for adults to have an ounce on them will equal … all these dogs being euthanized, that seems kind of ridiculous and hyperbolic,” he said. Macon County Sheriff Howard Buffett complained that this would make the dogs useless to the department, and would be a victory for drug dealers. “The biggest thing for law enforcement is, you’re going to have to replace all of your dogs. So to me, it’s a giant step forward for drug dealers, and it’s a giant step backward for law enforcements and the residents of the community,” Buffet said. In 2016, Buffett’s personal foundation reportedly invested $2.2 million in training for K-9 units throughout 33 counties across Illinois. It is strange that one of the excuses that they have for not wanting to retrain the K9s is that it would be abusive, but to train them to be vicious and keep them as attack dog slaves is extremely abusive in itself. There are likely millions of dog owners, trainers, and rescuers who would be willing to show these animals a loving home so they can grow to be social again. The use of dogs in police business is inhumane both for the animals, and the suspects who they are often unleashed on. Our society shuns animal abusers and people who raise dogs specifically for fighting, and rightfully so, but how are police dogs any different than an attack dog that a street gang breeds to be as aggressive as possible, for the purpose of winning money in dogfights and intimidating rivals? In many cases, these animals are often treated as nothing more than disposable weapons by the police that are in charge of caring for them. In fact, it is sadly common for police officers to get accused of animal cruelty for abusing or neglecting their dogs. Just this week The Free Thought Project reported that an officer was caught on video abusing his own search dog when the animal failed to signal for drugs at a traffic stop. It is also common for police to leave their dogs in hot cars for extended periods of time until they die. One police officer in Georgia killed three of his dogs, one by leaving it in a hot car, and two others by shooting them. Officer Daniel Peabody of the Cherokee County Marshal’s Office, buried the first two dogs in his yard and was eventually caught when he killed the third. When police dogs retire from official duty, they are supposed to return home and live with their handlers, but this is not always the case. In the state of Illinois where this controversy has happened, some officers reportedly dropped their dogs off at shelters after they were retired. If any other organization was caught treating animals like this on such a regular basis and were admittedly raising them to be aggressive, there would be massive public outrage and calls of animal abuse, but the police are allowed to be abusers so situations like this are often overlooked or ignored.